Let me be honest: I am a museum freak. At school, Art History was my favourite subject and this love has never ended. The Rijksmuseum in Amsterdam is therefore my idea of heaven; aside from the famous Dutch masterpieces, there is so much more to see! A few years ago, the museum was completely renovated and has never looked so stunning. The building is impressive and radiates the glory of the Dutch masters. Whenever the museum comes into view, I can barely contain my excitement. A visit to a beautiful museum never fails to fill me with inspiration, so whenever I leave the Rijksmuseum I am always bursting with fresh ideas. Are you also searching for inspiration? Buy your Rijksmuseum “Skip the line” tickets here! The Rijksmuseum houses so many beautiful works of art that it is often difficult to know where to start. The Gallery of Honour, where the works of the great 17th century masters hang, ending with the imposing Night Watch, is my favourite. In the Gallery of Honour you will find paintings by Johannes Vermeer, Frans Hals, Rembrandt van Rijn and many more world-renowned artists. When dusk falls, the Rijksmuseum shimmers with light. 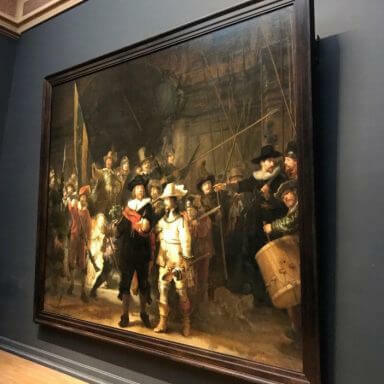 Rembrandt’s famous Nightwatch. One of the Rijksmuseum’s biggest attractions. The rest of the museum is divided by century. You will find an 18th century hall, 19th century hall, and so on. Artwork from the Middle Ages and the Renaissance can also be found within the museum. In my view, each of these spaces has its individual charm; I find it so fascinating to actually see how people lived during a particular era, and what craftsmanship existed in those times. Even though the Rijksmuseum’s collection is international, emphasis is placed on Dutch art and artists. An exception to the rule is the Asian Pavilion, which is well worth a visit. In the Asian Pavilion you will find Asian art spanning the centuries from 2000 BC to 2000 AD. Impressive sculptures, paintings and costumes; very different to the rest of the Rijksmuseum collections. 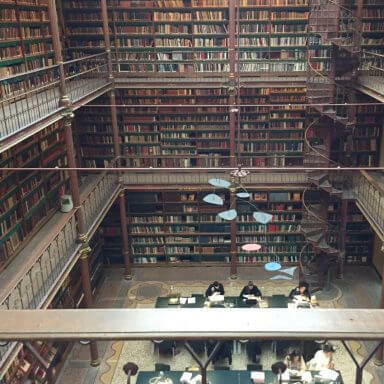 Don’t forget to visit the historic Rijksmuseum library, an impressive space packed with books. The library is open from Monday to Saturday from 10 a.m. to 5 p.m.
As well as the permanent collections, the Rijksmuseum often hosts a wide range of temporary exhibitions. This is great for me, a regular guest, but is also extremely interesting to the occasion visitor as these exhibits are always of an exceptionally high standard! You will be able to get close and personal to fine art by great masters, or contemplate the photographic collections of famous photographers from all over the globe. Once you have finished your tour of the Rijksmuseum collections, don’t hurry on to the next attraction. 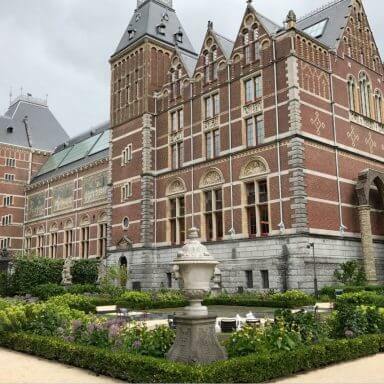 Be sure to get the most of your Rijksmuseum experience and admire the building from the outside as you wander through its beautiful gardens. Don’t forget to pay a visit to the beautifully landscaped museum gardens! The museum shop is also worth a visit. Although the items sold here are not cheap, they are beautifully produced. Masterpieces are reproduced onto postcards in the finest detail (well worth framing so you can admire them back home! ); the more popular paintings are printed onto biscuit tins, tableware and a wide range of high-quality items. The Rijksmuseum can get very busy. If you do not like crowds, or do not have the patience to follow them, I recommend you avoid visiting the museum on Fridays, Saturdays or Sundays. Plan a weekday visit, preferably as early in the morning as possible. Queues are usually quite long, so it would probably be best to order your ticket online before your visit, and skip the long line at the ticket office. You can buy your tickets here. In my personal opinion, the Rijksmuseum is not the most suitable day out when accompanied by (small) children; there are very few interactive elements within the museum and they may soon become bored. If you think your children would appreciate the experience, there is one great advantage – all children under 18 years of age can enjoy free admission into the museum. Because the Rijksmuseum is situated in one of Amsterdam’s busiest areas, you can use the public transport system to get there. Trams 7 and 10 stop practically at the entrance, giving you the opportunity to discover the beautiful surroundings of the museum square. If you want to get there by car, you can park in the secure car park underneath the Rijksmuseum; however, this is expensive. You could also rent a bike and combine the Rijksmuseum with a lovely tour along Amsterdam’s stunning streets and canals. If you would like to hire a bicycle for your Amsterdam trip, you can reserve one here. I finally found heaven. Gonna start saving. Great THANKS! 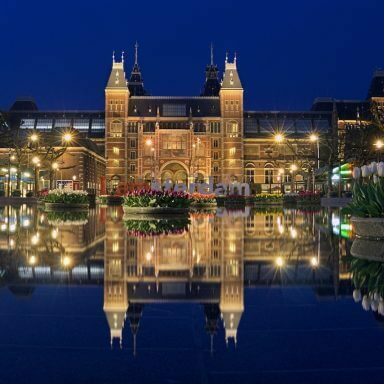 657 visitors rated The Rijksmuseum average 4.52 stars out of 5.